On 7th February 2017, Olive Industry ‘movers and shakers’ will come together to delve into the area of Marketing. At the forefront of the Olive Exposium 17, the ethos to making ideas happen is a key area to realising strong growth and a viable Olive Industry. Some new concepts are being presented to the Olive Industry for insight into the possible potential within your grove or marketing operations and we’re excited to introduce special guests Claire McAsh & Geoff Mun to tell their story about the successful collective marketing hub, Signature Oysters. Claire and Geoff will take you through their journey of how they have taken a premium product, challenged, changed and ultimately re-defined how Oysters are sold in today’s Australian market. If you are looking for new ways in which to realise growth within your business or methods for industry expansion, the Olive Exposium 2017 is a must event which you cannot afford to miss. There are more great topics … coming soon! It is with great pleasure we invite you to attend Australia’s independent leading olive industry event, the Olive Exposium – jam packed with focus topics, seminars, networking opportunities, education & training workshops, field work, forums & social events at some of the Fleurieu Peninsula’s award-winning wineries, EVOO tasting rooms and restaurants. The Exposium is hosted by The Olive Centre and we have partnered with Fleurieu Food to bring you the best of what the Fleurieu region has to offer and what a region it is! The OE17 is the biggest event in the Olive Industry calendar. It connects industry representatives throughout the supply chain – growers, processors, researchers, retailers, suppliers, culinary experts & national and international industry professionals. By attending this world-class event you will gain valuable insight and knowledge about new and innovative ways to take on your marketing, share ideas, raise the bar of quality, talk to the top researchers, connect with growers and how to make your ideas happen! It’s a very exciting time to be part of the Industry and now we are realising strong prices, strong consumer push for healthy products, growing production levels, improved growing styles, increased international interest for Australia-made & grown, multi-faceted ways products can be sold and developed. The OE17 will build optimism and deliver a programme promising to be as outstanding as ever! Key National and International Experts will cover topics like Exporting to China, Modern Marketing Trends & Buyer Behaviours, Breaking down the Cellar Door Experience, Tasting the Science of Olive Oil, Value-adding and much more to be announced over the coming months. Essentially focusing on Grove and Marketing elements are key to big industry growth. Networking opportunities and social events will help you to enjoy some of the best locations of McLaren Vale including the d’Arenberg multi-award winning winery and Primo Estate, an icon, in the culinary world of EVOO. So come along, mix business with pleasure, and enjoy all that the area has to offer in the stunning Fleurieu Peninsula! So what are you waiting for? Jump on-line now and secure your ticket (and great accommodation deals including FREE BREAKFAST and FREE PARKING). Go to the website: www.oliveexposium.com for more information or to book your tickets… the EARLY BIRD OFFER IS AVAILABLE NOW! The 2017 Olive Exposium (OE17) was announced by Amanda Bailey, Director of The Olive Centre, at the recent Royal Adelaide Olive Awards attended by over 100 growers, producers, processors, olive oil judges and suppliers at the National Wine Centre. The OE17 will take place the McLaren Vale in the spectacular Fleurieu Peninsula in South Australia. Images from 2015 Olive Exposium – Lore of the olive! Slideshow gallery – Olive Exposium 2015, Sunbury VIC. Olive growers from Australia and overseas will unite with industry professionals for the Olive Exposium 15, Australia’s largest event for the commercial industry, in Sunbury, Victoria, in November. Event organiser and managing director of The Olive Centre, Amanda Bailey, said the Olive Exposium will be a worldclass event for growers so they gain better commercial results in their grove, processing operations and marketing activities. It will be held at Pitruzzello Estate, Sunbury, on 26 and 27 November 2015. “Events like these are important to address the many issues which face today’s grower and processor,” Mrs Bailey said. These topics include growing olives in changing climates, strategies for managing the top five pests and diseases in olives, understanding smoke point in olive oils and other cooking oils, health claims, health benefits and how they relate to the food code, exporting premium products and much more. what does it take to be sustainable in the longer term in the Australian industry? where is the Australian supermarket sector going? 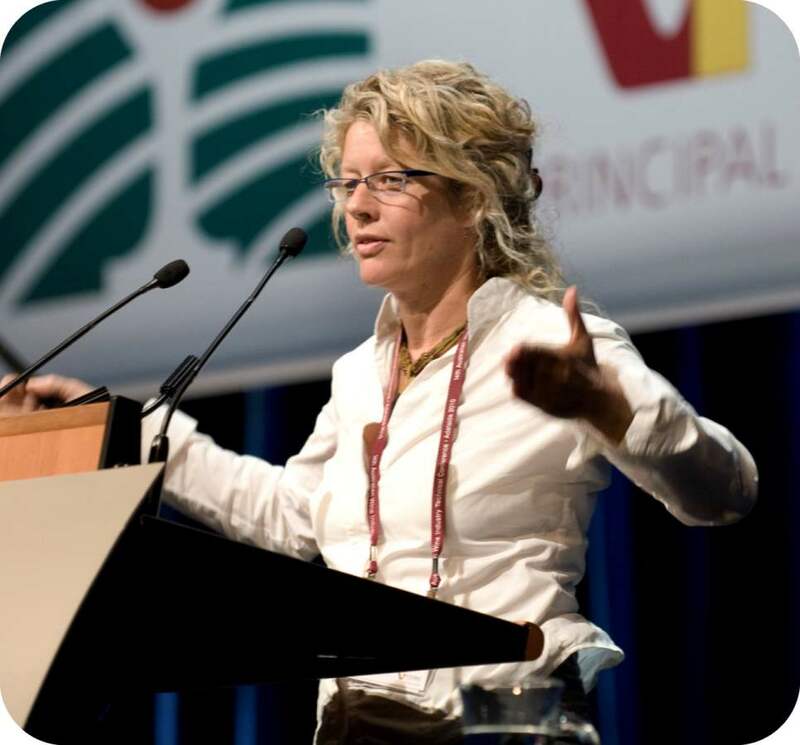 Growers will enjoy hearing from keynote speaker, Lyndey Milan, who has been instrumental in changing the way Australians think about food and wine for 30 years. ‘Hospitality of the table’ is her catchphrase, as evidenced by her numerous television appearances, nine best-selling books and countless culinary appearances over the years. Ms Milan hosts the latest ‘Taste of Australia’ television series, which features fresh extra virgin olive oil in abundance. Paul Vossen has been a farm adviser at the University of California Cooperative Extension (UCCE) since 1980.
growing in different climatic regions of California, and the influence of tree irrigation on olive oil sensory qualities. He also conducts olive pruning demonstrations every year and his online pruning video for olive trees has been one of the most visited sites on the UC-Sonoma webpage. about high quality olive oil. He was a founder of the California Olive Oil Council and developed the first olive oil taste panel in the US to become recognised by the International Olive Oil Council. Currently panel leader for the UCCE taste panel in Santa Rosa, Mr Vossen has been an olive oil judge and has trained other judges for several olive oil competitions all over the world. Growers from Australia and overseas will unite for Australia’s largest event for the commercial industry and will encompass a plethora of accomplished speakers specialising in olives including Lyndey Milan, Food & Wine Luminary and Paul Vossen, professed International Olive Expert. Growers have already expressed interest in the event as far as Turkey, Iran, New Zealand and Australia who are set to benefit from the extensive program, designed to steer the commercial industry to higher productivity. The world-class Exposium is a must for growers and producers to get those answers and gain better commercial results in their grove, processing or marketing operations. 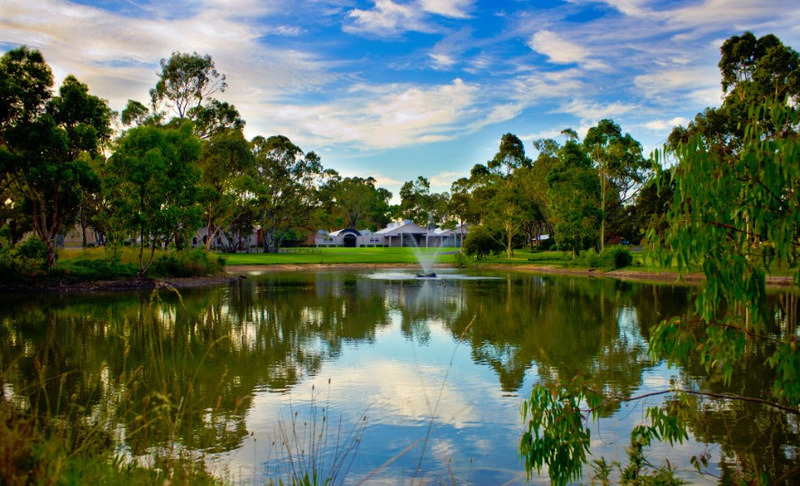 The Olive Exposium is to be held, during 26-27th November 2015, and will take place at Pitruzzello Estate located in the Sunbury region of Victoria. Event organiser Amanda Bailey says “Event like these are paramount to address the many issues which face today’s grower and processor. The tagline ‘lore of the olive’ symbolises the word ‘lore’ meaning “a body of traditions and knowledge on a subject or held by a particular group, typically passed from person to person by word of mouth”. “We will be brought together to discuss the latest issues surrounding the industry and give practical ways you can progress your grove in any direction with the plethora of topics on offer” says Amanda Bailey, Managing Director of The Olive Centre & Event organiser. Some of the topics to be covered include: Growing olives in changing climates, Strategies to managing the top 5 olive pests and diseases, Understanding smoke point in olive oils and other cooking oils, Health claims, health benefits and how this relates to the food code, Exporting premium products and much more. The Olive Centre is not just about equipment & machinery supply but are here to backup growers through technical advice and many free services that growers & processors rely upon. Australian food and wine luminary combines a thirst for life and a sense of fun with a love of good food and sparkling shiraz. A familiar face on television and in print, she has been instrumental in changing the way Australians think about food and wine for thirty years. ‘Hospitality of the table’ is her catchphrase, as evidenced by her numerous television appearances, nine best-selling books and countless culinary appearances over the years as she maintains her position at the forefront of Australian cuisine. Lyndey is the host of the latest TV series ‘Taste of Australia’ which features Fresh Extra Virgin Olive Oil in Abundance. In the last 10 years climatic conditions in the Olive Industry have been challenging in many areas, to say the least. Australian Growers have had to withstand drought, floods, bushfires, strong winds and the list goes on…. BUT What changes are projected for the coming years? Is there another El Nino on the way? What are some of the likely impacts, both short term and long term, of climate variability and change? Dr Leanne Webb currently works with the University of Melbourne exploring the impacts of extreme temperatures on horticultural crops. Prior to this, Leanne worked for the climate projections team at CSIRO offering tailored climate projection data and services to climate change impact researchers and stakeholders. Leanne has published extensively in the field of climate change impacts and is a contributing author to the latest IPCC Working Group II report (Australia and New Zealand chapter). Past doctoral research included an exploration of the potential impacts of climate change on the Australian wine industry with subsequent research focused on identifying adaptation options for this sector. Experience working in an industry setting as a viticulturist has proven highly instructive to Leanne’s approach in her wine industry related studies, and remains relevant in her current role. 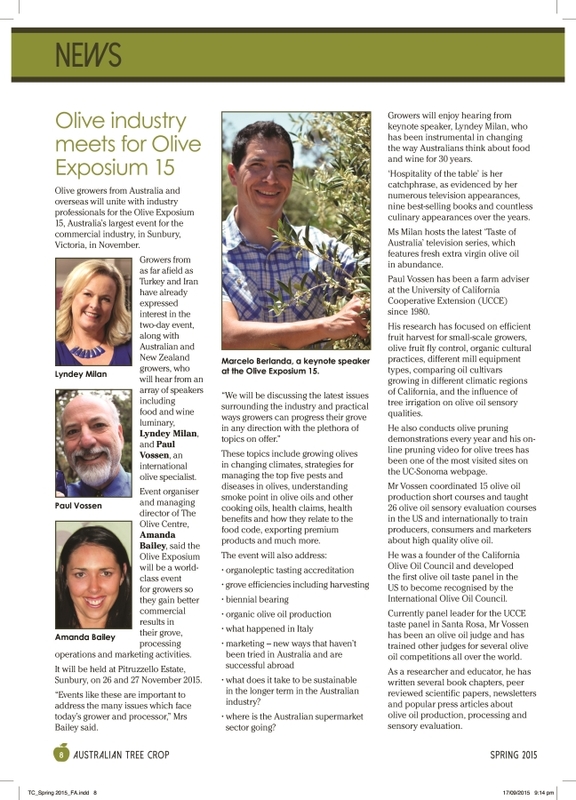 Save the date: Olive Exposium 2015 – 26 e 27 novembre a Victoria, in Australia. Non dimenticate di aggiungere, nel vostro diario, le importantissime date dell’Australian Olive Exposium 2015 che si svolgerà a Sunbury, Victoria (Australia). Olive Exposium 2015 arriva a Victoria, in Australia, per realizzare insieme ai coltivatori, trasformatori e esperti qualificati del settore, un grande evento a tutto tondo sull’olio extravergine di oliva. Ad organizzare il tutto Amanda Bailey, direttore di The Olive Centre, che è il principale fornitore australiano di attrezzature per l’olivicoltura e l’elaiotecnica e che, più di altri, ha contribuito allo sviluppo del settore dell’olio in Australia, essendo da sempre impegnato a fornire il massimo livello di servizi, attrezzature e consigli agli olivicoltori. “Se sei un olivicoltore o un produttore di olio extravergine di oliva, non solo australiano, non puoi perdere l’evento di livello mondiale, dichiara Amanda Bailey. All’Exposium si discuterà di tutte le questioni che circondano la filiera dell’olio di oliva e, grazie alla pletora di argomenti in offerta, verranno date informazioni pratiche su come far progredire e sviluppare il proprio oliveto. Assistere ed interagire nei due giorni di Olive Exposimum – continua la Bailey – significherà acquisire il know-how necessario per il progresso ed il cambiamento, e ne contempo realizzare appieno le potenzialità del vostro oliveto”. Il focus dell’evento sarà puntato sulla “‘Tradizione dell’olivo”, dove la parola “tradizione”, ha da intendersi nei suoi molteplici significati: mitologia, mito, leggenda, storia, tradizioni, folklore, favole, tradizione orale, mythos! “Questa è una Expo che non puoi permetterti di perdere! Afferma la Bailey. Dopo tutto, abbiamo tanto da imparare nel nostro settore ed il nostro ampio programma ha molto da offrire. Il numero di biglietti è limitato, quindi assicuratevi di prenotare in anticipo in modo da non perdere questa incredibile “Expo” dell’olio di oliva. Se avete bisogno di ulteriori informazioni o volete vedere la gamma di argomenti trattati ed i relatori, o per effettuare una prenotazione, conclude Amanda Bailey, visitare il sito web all’indirizzo www.oliveexposium.com“. Mostra di più: Olive Exposium 2015 – 26 e 27 novembre a Victoria, in Australia. 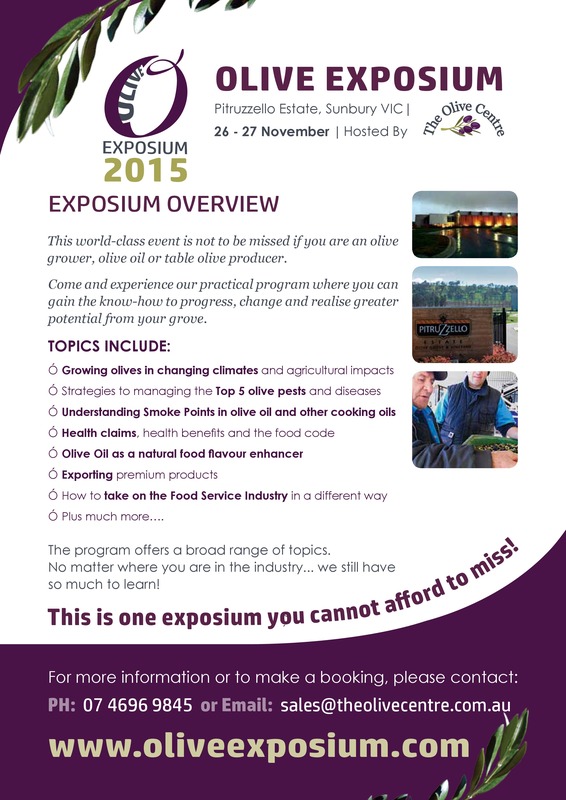 Don’t forget to mark your diary for 26 – 27th November for the Olive Exposium 2015 located in Sunbury, Victoria.